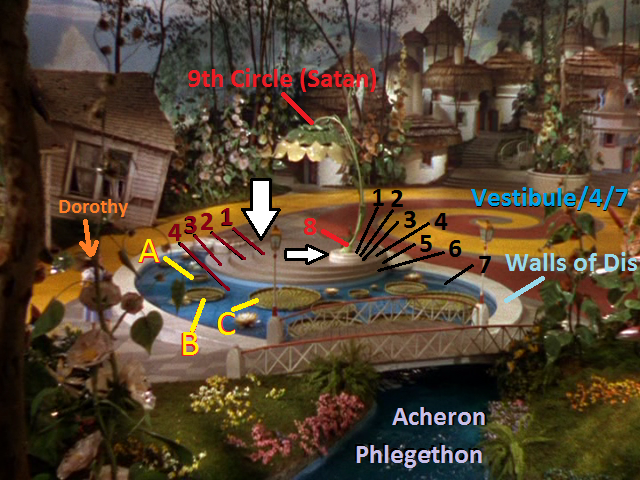 In part 2 of this analysis, it was stated that in terms of Dante's Inferno, Dorothy starts out, upon her arrival in Muchkinland, in the vestibule at the entrance to Hell, and in circles 4 and 7 of Hell (as labeled in darker blue text in the screencap at left). 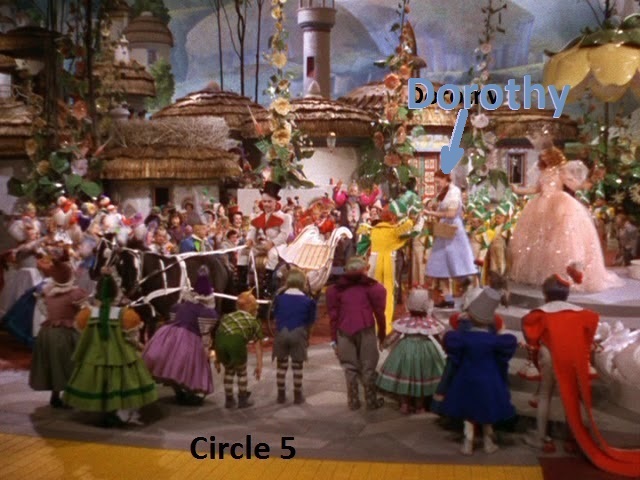 Later in the analysis, it was stated that the 'Good' Witch at one point leaves Dorothy circle 5 (as shown in the two screencaps below), but that ultimately, she ends up at a lower level than that at which she first started. Above left: Dorothy descends from the top level of the gray platform structure, which in this scenario represents the vestibule of Hell (for Dorothy), toward circle 5. 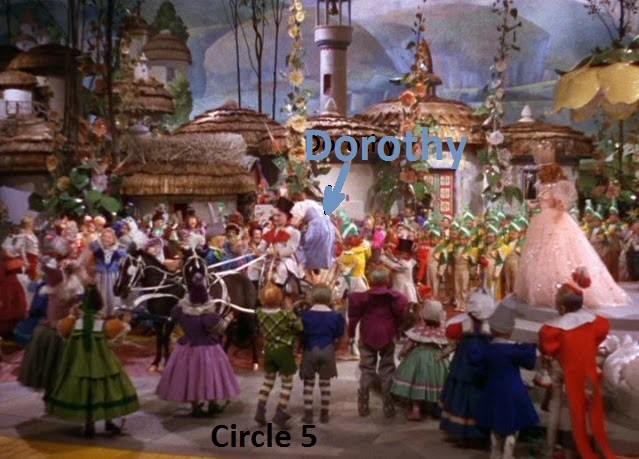 Above right: Dorothy gets into a horse-drawn carriage in circle 5. The reader of this analysis will note that circle 5 is higher than circle 7. Does this mean that things have actually gotten better for Dorothy, at some point? No. It means that her ending up in circle 5 is to be taken as being below circle 4. In fact, as we will see, Dorothy ends up in three circles each of which is two levels lower than its corresponding starting place, i.e., she ends up in circles 2 (two levels lower than the vestibule), 6 (two levels below 4), and 9 (two levels below 7), the last of these by virtue of the fact that she ends up in the part of Emerald City that is in circle 9.
a. Wikipedia, 'Lust'. Web, n.d. URL = https://en.wikipedia.org/wiki/Lust. b. Wikipedia, 'Whore of Babylon'. Web, n.d. URL = https://en.wikipedia.org/wiki/Whore_of_Babylon. c. Image from the Wikipedia Bangerz Tour page; Miley Cyrus performing in Vancouver 2014 2 (cropped) by Rob Sinclair, licensed under CC BY-SA 2.0 via Wikimedia Commons.